Oceans Seven condominium is located in the greater Daytona Beach Shores area surrounded by all the necessities including grocery store, pharmacy, banks, community center, golf course and excellent restaurants! 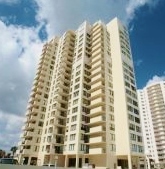 This 20 floor 108 unit complex has laundry on each floor and is located on the drive beach. 1 and 2 bedroom units available. The minimum rental is 3 months and no pets are allowed. This complex is very similar to the layout of Oceans One. A great affordable oceanfront complex that you must see!